It would be easy to think that the Romans managed to conquer so much of Europe because of their military. Sure, having an enormous army and all the weaponry that came along with it was certainly helpful, but the Roman Empire was able to grow because of something more important. Once they had conquered a region, they made it better… and then used that as leverage. In the south of France, about 25 kilometres west of Avignon, you’ll find the Pont du Gard. This enormous limestone bridge, built by the Romans, is an engineering masterpiece – and I’ll come back to that shortly. But it is also a perfect example of how the Romans tried to make themselves indispensable. 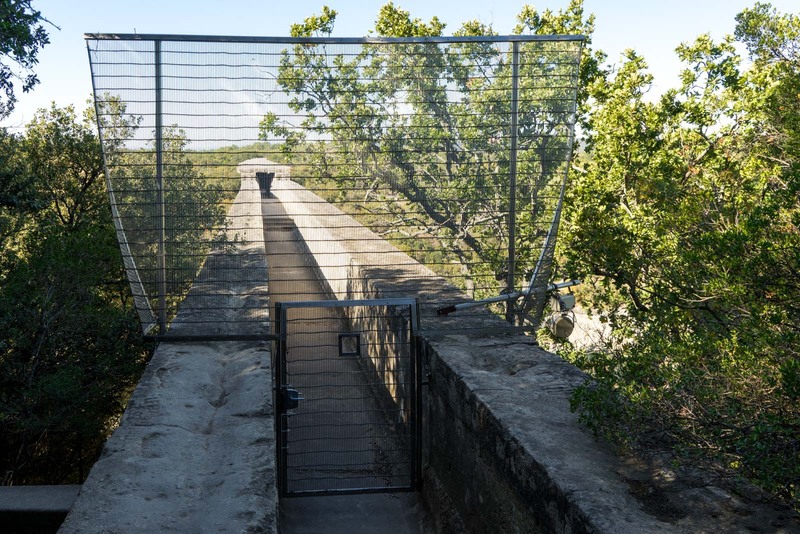 The Pont du Gard bridge was never intended to be used for people to cross. 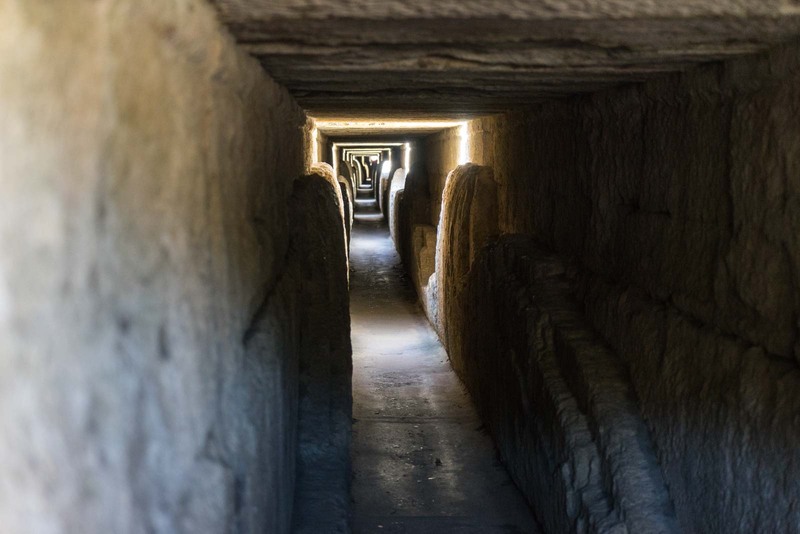 It was built as part of an aqueduct that was 50 kilometres long and stretched from a spring at Uzès down to the colony at Nîmes. The water that it brought was used, of course, for drinking. But it was also used for sanitation and to fill impressive Roman baths. 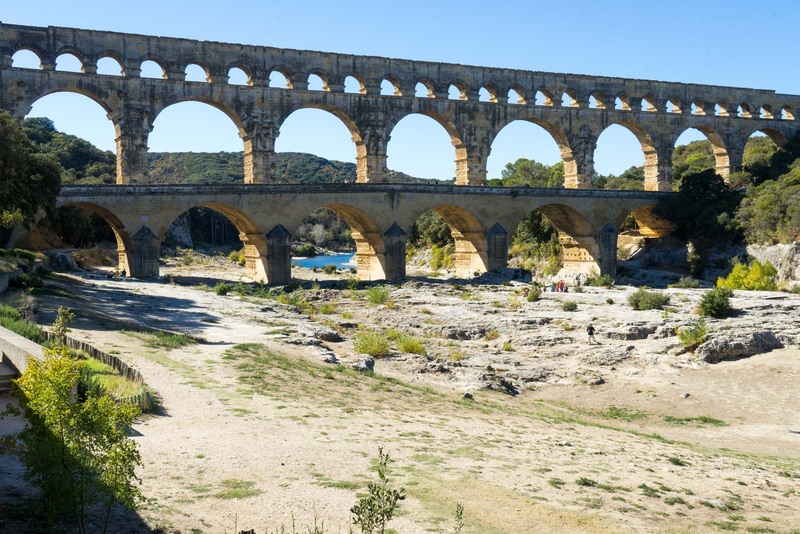 The aqueduct provided an average of about 600 litres of water a day for each of the 50,000 inhabitants of Nîmes. The Romans had now positioned themselves as providers, not invaders. All of this infrastructure was new for the people in the town and constant clean water seemed to be almost a miracle. 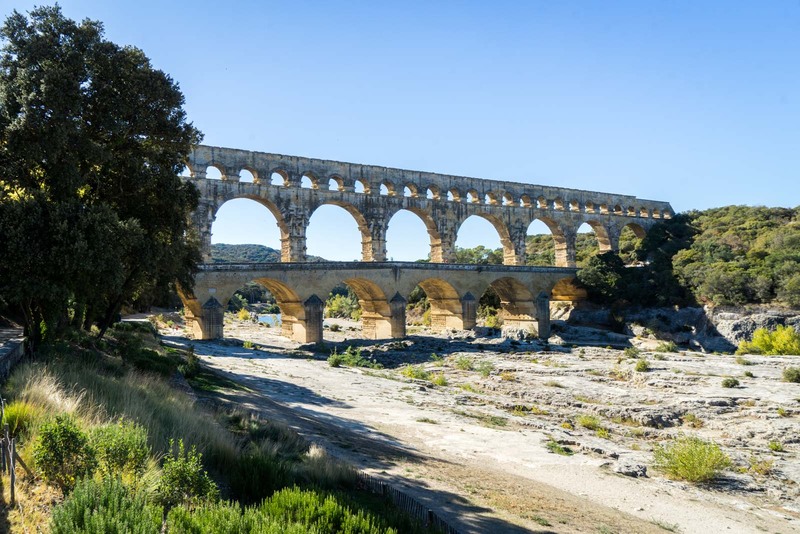 What is the Pont du Gard? A miracle, it was not. But it was the result of extremely clever engineering. The idea of an aqueduct is relatively simple – if there’s a channel that is always pointed slightly downhill, then gravity will just carry the water along it. But the genius comes from creating that constant downhill slope when you have uneven terrain – including valleys and rivers. 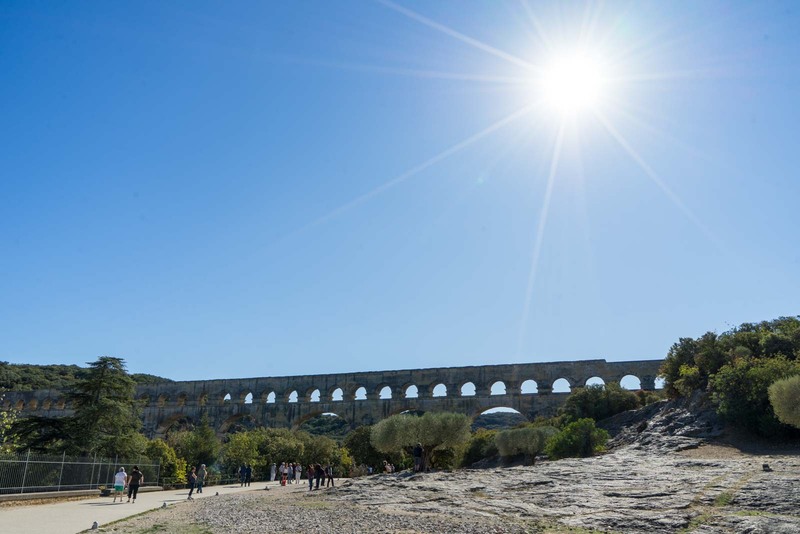 This is why the aqueduct is 50 kilometres long even though the direct distance to Nîmes is only 20 kilometres – because it goes around mountains and along easier sections. It’s also the reason why the bridge was needed here to cross the Gardon River, because there was no going around it. And it’s why the terrain made it necessary to build it to such an impressive scale, to keep the slope accurate. I didn’t realise until I stood in front of the Pont du Gard how large it really is. In photos, it is hard to get a sense of the scale. In person, it is awe-inspiring. 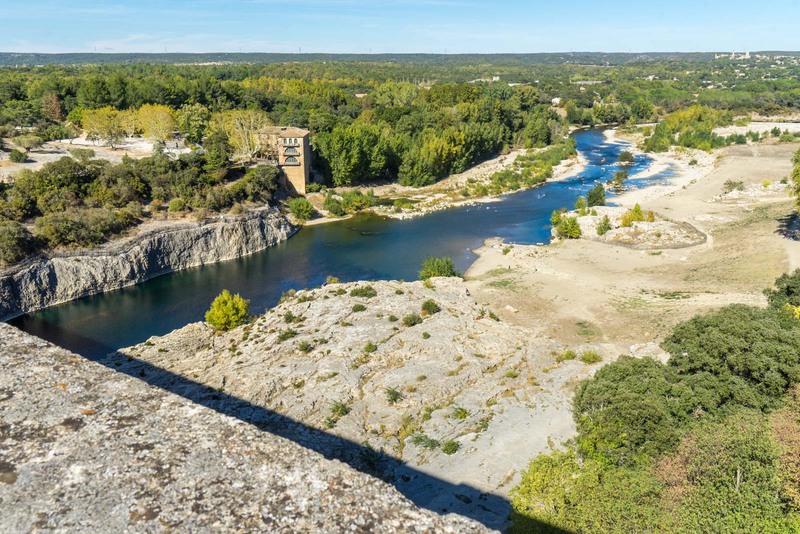 The top of the Pont du Gard is 49 metres above the river. It is 274 metres long and, at the bottom, 9 metres wide. One of the reasons it looks so impressive is because it has three layers of arches – one of the few Roman bridges that had that many. Interestingly, the Pont du Gard probably didn’t need to have three levels of arches. The Romans soon worked out how to build bridges with taller arches, which saved time and money. But, at the time, they weren’t exactly sure of the mathematics and so they built more layers to err on the side of caution. It also looked more impressive and, as they were conquering new territories, showing their power to the colonies was a bonus. 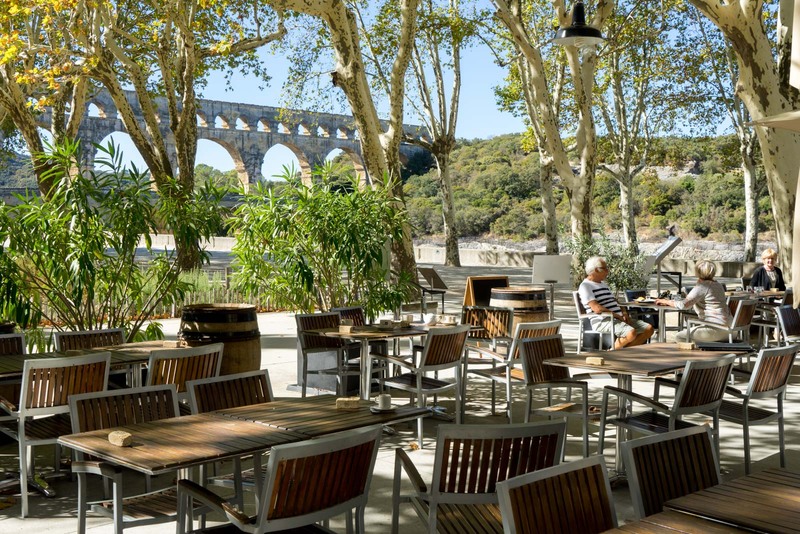 When you visit Pont du Gard, there are several ways to experience it. The first is to do as I initially did and just stand there with your jaw slightly gaping and take in the sight from a distance. But then, of course, you need to get closer. You can cross from one side of the river to the other along the lowest level of the arches (this path wasn’t initially here and was only added in the 18th century). It may sound silly, but the bridge does look different from each side. It’s also worth going along the tracks further down the river and looking at the perspective from that side as well. 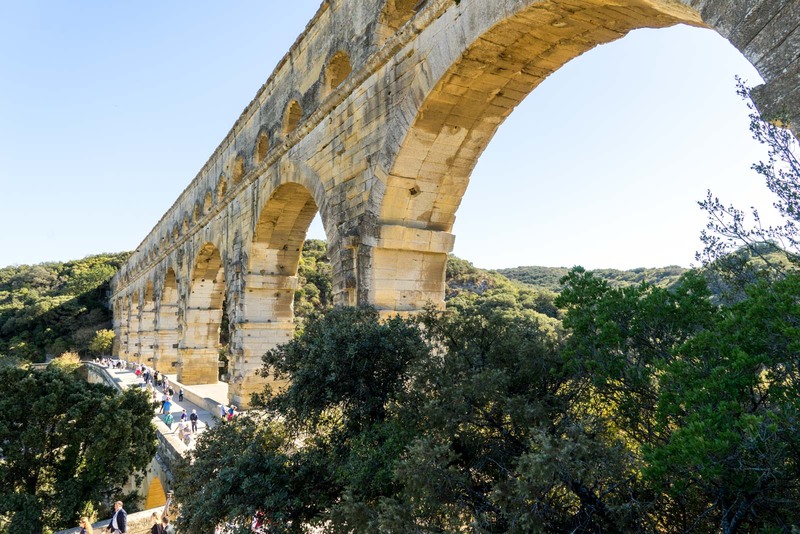 To really appreciate the engineering genius of the Pont du Gard, I would recommend taking one of the guided tours that will lead you through the aqueduct passage that the water would once have passed through. High up on the third level, surrounded by stone you get a sense of how it all worked two thousand years ago. As you walk through the water channel at the top of the bridge, take note of the slope that allowed gravity to carry the water. You’ll probably hardly even notice it. That’s because, over the 50 kilometres of the aqueduct, the water only drops by 17 metres. The section here over the bridge drops just 2.5 centimetres over the course of 456 metres. On a warm day, you can also hang out by the river – and you’ll see plenty of people doing that. Bring a picnic or buy some food here. Go for a swim, lie in the sun. 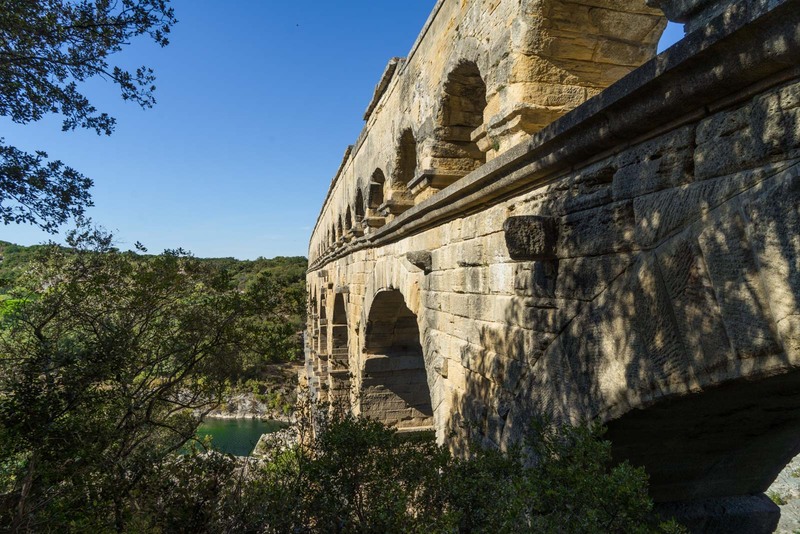 The Pont du Gard is more than just a historical site. It’s also intended to be a place to relax. 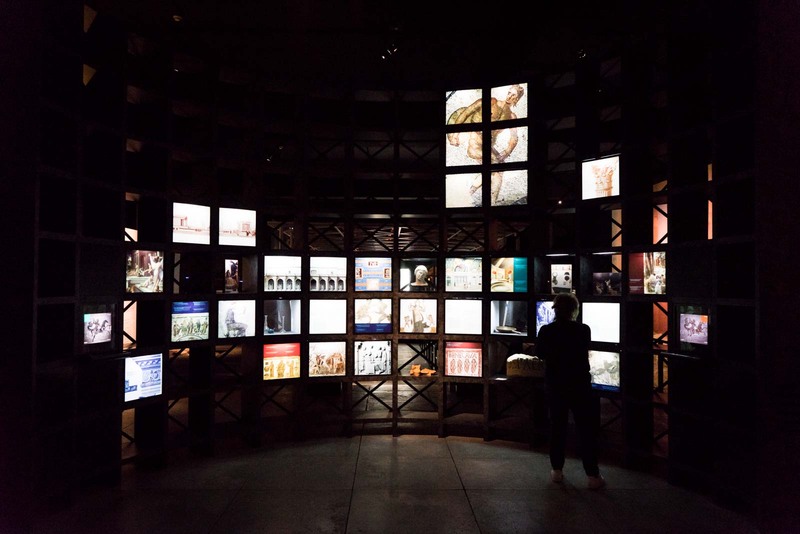 I would also suggest you definitely visit the museum on the site. It’s put together very well and will give you lots of information about what this is such an important Roman monument and why it’s been listed as a World Heritage Site. Before I went myself I always saw places like this and thought “Would be cool to go there. But I probably wont anyways”. All those places, the cities in movies and tv. It was all nice to know, but it was all too distant. Fast forward to know: It is purely incredible to REALLY have seen those places! And pont du gard is very impressive, a little bit like the Roman Street in Narbonne. Thousands of years old. You still can see where the people walked, and drove their cars. Pont du garde though doesnt really have proper flags for germany though. Its the belgian flag. And when confronted they say “Its the right colours isnt it?” hahaha Frenchies! 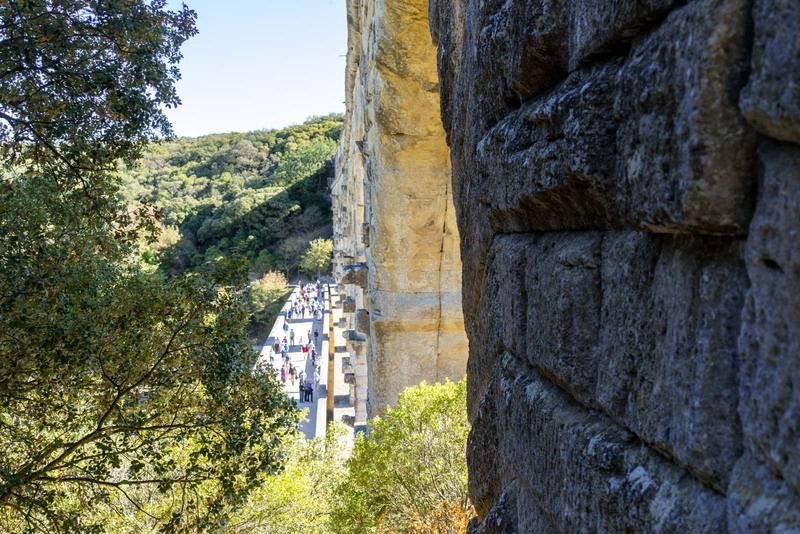 Hey Dom – I know exactly what you mean about visiting somewhere like Pont du Gard that still has the marks of history in it. It’s one thing to know that a structure is thousands of years old – it’s another to see all of these marks that prove it! I’m so glad you managed to see some of these places for yourself!